Please make sure you have read the applicable Administration Manual before you begin, which explain the mechanics of working with the Indexing Form and provide an overview of member and pro indexing in EYB; if not please review before starting to index. Professional Indexing - Administration Manual. It is also mandatory that you read the comprehensive instructions in this manual for how to correctly index each field of the Indexing Form. The ? next to each field name on the Indexing Form will take you directly to the instructions for that field; you can access the same information below by going to the section pertaining to each field. These guidelines are very detailed and may at first seem a bit daunting, but it's important to have consistency across all the indexing data. By understanding the EYB 'rules' it will save both you and EYB editors a lot of editing time. Once you understand them, indexing becomes a very simple process. DO check the Recipe Types List for how to categorize many common recipes by Recipe Type, Ethnicity, Course, and Nutrition, plus capitalization of many words in titles. DON'T list the common pantry ingredients that fall below the thresholds in the Store-Cupboard Ingredients Table, unless they're in the recipe title. DO read and refer to the sections below for each field of the Indexing Form for complete indexing guidelines. This list is just the tip of the iceberg! And DO check the Change Log frequently so you don't miss important updates. Typos in original: correct them in the Title field, but do not mistake US vs. UK spelling variations - use the spelling in the Ingredients list. Use of accents: If the book uses accents, use them; if it doesn't, don't. See below for more help on accents. It's a good idea to add the Character Map to your Start menu (right click on Character Map and select 'Pin to Start Menu') for easy access. Mac users can use Option keys or the KeyCaps desk accessory located under the Apple menu. WARNING: Beware of misplaced accents -- there is a world of difference between the French words “pâte” (pastry) and “pâté” (meat paste)! Enter recipes in the same order as they appear in the book. The Sort Order number is assigned automatically by the system, starting with "0" for the first recipe, then in increments of 10 ("10", "20", "30", etc.) to allow for the insertion of up to 9 missed recipes between any two recipes in the book. If you miss a recipe, you may edit the Sort Order number to maintain book order. Refer to your Admin Manual (click here: Professionals) (click here: Members). NOTE: DO NOT CHANGE the system-assigned Sort Order value unless you are inserting missed/additional recipes. For the recipes to appear in the same order as the blog, it is important to start with the oldest entry and index in date order. This will ensure that the latest recipes will appear first in the recipe list. Once the blog has been indexed and published all new recipes are added by EYB. This field is not mandatory; some recipes will have no Recipe Type. You can allocate more than one Recipe Type where appropriate; see below for how to index Recipe Types for sub-recipes within recipes. To correctly categorize recipes, refer to the Recipe Types List for a list of commonly encountered dishes and their corresponding Recipe Type. The list also includes many Ethnicity and/or Course values associated with certain recipes/dishes. Values in the Recipe Type field automatically copy to the next blank record. If a carried-over Recipe Type does not apply to the current recipe, just change or delete it. HINT: Keep the Recipe Types List open on your computer so you can search for recipes as needed using your browser's Find function. There are some recipes for which no Recipe Type applies. Refer to the end of the Recipe Types List for selected dishes with no Recipe Type. For simple meat, poultry, and fish/seafood main dishes -- baked, poached, sautéed, etc. -- there is often no Recipe Type, so leave the Recipe Type field blank unless there is an indexable sub-recipe for a sauce, chutney, etc. e.g. A salad recipe with a dressing sub-recipe, categorize as both Salads and Dressings & marinades. e.g. "Chess pie with blackened pineapple salsa & caramel sauce" - categorize as Pies, tarts & pastries; Dips, spreads & salsas; and Sauces for desserts. e.g. "Roast chicken with corn relish," categorize as Chutneys, pickles & relishes. For more information on indexing sub-recipes, see also Recipes within Recipes. This field indicates the ethnic cuisine of origin or influence/inspiration of the recipe, if any. You can allocate more than one Ethnicity where appropriate. Select the most specific Ethnicity that applies to the recipe in question, e.g. for a recipe entitled “Spicy Szechuan chicken,” index Chinese, not Asian. Chinese recipes would also be found in an Asian search, so there is no need to "index up" the hierarchy. If an entire book or an entire section is about one ethnic cuisine, e.g. for a Tuscan cookbook or chapter, you should index Italian in Ethnicities for every recipe, unless the Recipe Types List provides instructions to the contrary about a recipe's "default" Ethnicity. For example, a classic French recipe, like Béchamel sauce, should still be indexed as French even if it appears in an Italian cookbook; if there is an Italian "spin" on the recipe, index both the default Ethnicity French and Italian. - for “gumbo” recipes, categorize as Cajun & Creole, etc. Refer to the Recipe Types List for a list of pre-associated Ethnicities. If a city/region/country is in the recipe name, e.g. for “Greek lima bean dip,” categorize as Greek. Or, if the author mentions a city or country in the introduction/headnote, e.g. “This recipe is inspired by a traditional Provençal dessert,” categorize as French. If a recipe’s origin is described as “Latin (American),” index South American and Central American. If a recipe's origin is described as "French-Canadian," index French and Canadian. If a recipe's origin is described as "Pennsylvania Dutch," index American. If a recipe's origin is described as "Southwest(ern)" referring to the US Southwest, index American. Values in the Ethnicities field automatically copy to the next blank record. If a carried-over Ethnicity does not apply to the current recipe, just change or delete it. If a recipe’s name is given in a foreign language in addition to, or instead of, English, use that as the ethnicity -- e.g. “Marseilles-style mussels (Moules à la Marseillaise)” would indicate French ethnicity -- unless the Recipe Types List instructs otherwise. If the recipe’s name or author’s comments mention its origins in some part of the United States, e.g., “New England clam chowder,” then select American, or one of the US cuisine-specific Ethnicities: Cajun & Creole, African American, Native American, Hawaiian, or American South (for US Southern cuisine). DO NOT also index American if a more specific US Ethnicity applies. - However, an American cookbook does not automatically mean that the recipes it contains are of American ethnicity, e.g., a gazpacho recipe appearing in an American cookbook would still be indexed as Spanish (the default Ethnicity for gazpacho). - If the recipe puts an American “spin” on the classic Spanish soup - e.g. “California gazpacho” – index both Spanish and American. - For “Tex-Mex,” index Mexican and American. If a dish is eaten all over the world – omelets, pizza, kebabs, quiche, etc. – do not index an Ethnicity unless the recipe is specifically identified as being from a country/region, such as “Pizza Napoletana” or “Moroccan chicken kebabs,” or appears in a section devoted to one ethnicity. These “international” recipes that are considered to have lost their original ethnic origin appear in the Recipe Types List with no default Ethnicity in square brackets. If the entire book or an entire section is devoted to one course, apply to every recipe unless as noted in an exception below or in the Recipe Types List. Follow the Recipe Types List instructions about a recipe's "default" Course even if they contradict what the author/book says. For example, even if the author/cookbook has categorized cookies in a Desserts chapter, you would NOT index a cookie recipe as Dessert, since Afternoon tea is the default Course for cookies. e.g. “serves 4 as an appetizer,” index Appetizers / starters. e.g. all “chili” recipes would be indexed as Main course. e.g. “serves 8 as an appetizer or 4 as a main course,” index all the Courses that apply. Put all meat, poultry, fish, and pasta dishes into Main Course (and/or Appetizers or Small plates, if so specified), as well as any other Courses indicated by the author/cookbook. Index all simple vegetable and grain/pulse recipes as Side dish, as well as any other Courses indicated by the author/cookbook. Only index a Course for soups if one is specified, such as Appetizers, Main course, etc. ; fruit soups may be indexed as Dessert or as specified by the author/book. e.g. sauces, pastry/pizza dough, frostings/fillings, dressings/marinades, etc. Do not index the category General courses, which applies only to Books in the EYB Library. For many recipes the Course may not be obvious, so refer to what the author specifies as long as it doesn't contradict instructions in the Recipe Types List. If there is no course information provided in the cookbook, in these guidelines, or in the Recipe Types List, leave this field blank. Values in this field copy from the entry in the previous recipe. If a carried-over Course does not apply to the current recipe, just delete it. Refer to the Recipe Types List for more information on default Courses for certain recipes/dishes. If an entire book is devoted to an occasion, apply to every recipe unless as noted in an exception below or in the Recipe Types List. If a chapter or section is devoted to an occasion, or a book is divided into sections by season, apply to every recipe in that section unless as noted in an exception below or in the Recipe Types List. If the author's comments mention an occasion such as “I like to make this dish for parties”, index as Dinner parties / entertaining. If a Season, Holiday or Event appears in the recipe name, such as “Spring vegetable soup” or “Halloween cake”, index that Occasion. If a dish serves 10-12+, index as Cooking for a crowd. NOTE: This guideline does not apply for normal recipe yields of most baked goods, e.g., cookies, muffins, bars/slices, and small cakes usually yield one or more dozen; large cakes often yield at least 10-12 portions; etc. Only index Cooking for a crowd for baked goods recipes that yield more than the normal number of servings. Only index Cooking ahead if the dish can be: (1) entirely cooked ahead, such as soups, stews, cheesecakes, trifles; (2) assembled ahead and baked before serving, such as stratas, frittatas; or (3) substantially prepared ahead in its component parts, then assembled, baked, or reheated before serving. Do not index the category Seasonal, which applies only to Books in the EYB Library; instead, index the specific season -- Winter, Spring, Summer, Fall/autumn -- if one is mentioned/implied in the recipe title or specified by the author/cookbook. NOTE: If substantial advance preparation (such as marinating) must be done in advance, include a warning that advance prep is needed in an EYB Comment -- e.g. "Beef must marinate for 4 hours or overnight." -- instead of indexing Cooking ahead. The idea behind Cooking ahead is to indicate that most or all of a recipe’s preparation can be done in advance to save the cook time on the day of/before the meal/party/event. Most slow-cooker recipes, for example, should be indexed as Cooking ahead. - a chapter/section is for a special diet or nutrition such as Low salt, Diabetic, Dairy-free. NOTE: EYB doesn't always create new ingredients for every low-fat, low-calorie, etc. version of most dairy (and other) products; instead, list the "normal" ingredient and index an appropriate Nutrition tag if the focus of the recipe is Low fat, Low calorie, Low carb, Low salt, or Low sugar. Be aware, though, that recipes titles can mischaracterize Nutrition content -- for example, "gluten-free" is sometimes erroneously equated with "wheat-free", but many other grain products contain gluten, including kamut, farro, spelt, barley, and rye, among others. Indexers should be alert to mislabeled recipes and include an appropriate EYB Comment, e.g., Despite "gluten-free" in the title, this recipe has not been indexed as Gluten-free because it contains couscous. Vegetarian/Vegan: Always index a recipe as Vegetarian and/or Vegan where applicable, even if the recipe does not specify, according to EYB's definitions and guidelines regarding Vegetarian and Vegan - see "More information about Vegan and Vegetarian" below for further details. Kosher: Index the Kosher Nutrition tag when the book/author indicates that a recipe conforms to kosher dietary laws. NOTE: Kosher is not synonymous with Jewish, and recipes from other cuisines may be tagged as Kosher where applicable. Only tag Kosher in Nutrition and Jewish in Ethnicities when a traditional Jewish recipe -- as specified by the book/author or as indicated in the Recipe Types List with [Jewish] as the default Ethnicity -- is indicated as kosher. Do not index the category General health conditions, which applies only to Books in the EYB Library. NOTE: Except for Vegetarian and Vegan as described above and in the More information... section below, EYB does not set nutritional standards for recipes, but instead relies on how the author or cookbook characterizes recipes (provided the recipe is not mislabeled as described above). Values in this field copy from the entry in the previous recipe. If a carried-over Nutrition value does not apply to the current recipe, just delete it. See the Recipe Types List for how/whether to index Vegan and Vegetarian for each Recipe Type. A few Recipe Types are not indexed as either Vegan or Vegetarian; in some (usually savory recipes), both Vegetarian and Vegan should be indexed if both apply; and in still others (usually sweet/dessert recipes), only Vegan is indexed where applicable. If a recipe contains no meat, fish/seafood, poultry, or products of animal slaughter -- including meat/fish/poultry stock or broth, anchovies, bacon bits, pancetta, lard, suet, chorizo, fish sauce, oyster sauce, bonito flakes, animal rennet, and animal gelatin -- then list it as Vegetarian in Nutrition, subject to the Recipe Types List rules for the Recipe Type in question. NOTE: Normal Worcestershire sauce contains anchovies, so do not index Vegetarian unless vegetarian/vegan Worcestershire sauce is listed. If the recipe contains no animal-derived products of any kind -- including eggs; dairy ingredients such as milk, cream, yogurt, cheese, crème fraîche, ghee, gelato, and sherbet; and honey -- then list it as Vegan in Nutrition, subject to the Recipe Types List rules for the Recipe Type in question. NOTE: There is animal gelatin in regular marshmallows, so recipes containing marshmallows are not Vegan (or Vegetarian); however, marshmallow fluff/creme does not contain gelatin. Special note about cheese and Vegetarian: Specific cheeses may or may not contain animal rennet, and although there a few 'vegetarian...cheese' ingredients in the Ingredients database that you can index, it would be impractical for EYB to create "regular" and vegetarian versions of every cheese ingredient. EYB assumes that vegetarians who object to the possible presence of animal rennet in cheeses will substitute a comparable non-animal-rennet cheese, therefore it is acceptable to index Vegetarian on recipes that contain cheese, subject to the Recipe Types List rules for the Recipe Type in question. Obviously, recipes containing cheese cannot be indexed as Vegan unless they call for a vegan (non-dairy) cheese and are free of other animal-derived ingredients. Other possible non-Vegetarian and non-Vegan ingredients: Recipes can call for many other processed ingredients that may or may not contain "hidden" animal-derived products, e.g., margarine may contain trace amounts of dairy; prepared pie crusts may contain lard; red candies may contain carmine (from crushed insects); beers and wines may contain or employ animal products such as isinglass (fish bladders) or gelatin; seemingly "dairy-free" and "egg-free" cookies, crackers, and other baked goods may contain whey, lactose, or albumin (from egg whites); etc. As long as there are no clearly animal-derived ingredients called for, it is acceptable to index recipes calling for possibly taboo ingredients as Vegetarian and Vegan on the assumption that vegetarians and vegans will check product ingredients and substitute an acceptable product where necessary. If the recipe for the suggested Accompaniment has already been entered, choose it from the alpha drop-down list. If you have not yet entered that recipe, make a note and enter it at the end of the book. Use the Indexer Notes to mark that you need to do this. The relationship between Accompaniments is reciprocal, e.g., if a side dish recipe is listed as an Accompaniment to a main dish recipe, that main dish recipe is also listed as an Accompaniment to the side dish; see below for more information and specific examples. When the author puts a menu together with a main course and a couple of side dishes from the book, or offers the option of serving a sauce with a dessert. If two or more sauces are suggested to accompany a dessert. However, the reciprocal relationship should be made only between each sauce and the dessert in Accompaniments, not between the sauces themselves. When the author suggests other recipes in the book that could be served alongside/in the same course as the present recipe. When the author suggests a recipe that could be served before or after the present recipe. For example, a dessert would not be listed as an Accompaniment to a main course even if the author has grouped the two dishes in the same dinner menu. e.g. Pasta alla nonna includes the book's home-made tomato sauce as an ingredient - list the sauce ingredients in the pasta recipe. e.g. Masala omelet with green chile chutney - list the chutney ingredients in the omelet recipe. e.g. A "Maple layer cake" recipe includes a sub-recipe "Maple buttercream frosting". If the frosting recipe is suggested as an Accompaniment to another recipe it must be indexed as a separate recipe as well as part of the cake recipe. Do not list the ingredients if the included/extra recipe is for stock or broth. Just list an appropriate stock or broth ingredient – chicken stock, vegetable broth, etc. – rather than listing all the broth/stock ingredients. Do not list the ingredients if the included/extra recipe is for a spice/herb blend or rub. Just list an appropriate spice/herb blend or rub ingredient – za'atar, chermoula, etc. – rather than listing all the blend/rub ingredients. Do not list the ingredients if the extra recipe is suggested as an add-on/go-with such as a sauce or condiment that, although listed in the main recipe's ingredients, is really intended to be served alongside. For example, a swordfish recipe lists a separate lemon sauce recipe from the book in its ingredients list or instructions, but states "Serve with the lemon sauce alongside"; in this case, the sauce is an Accompaniment, not an integral part of the swordfish dish, so cross-reference the lemon sauce and the swordfish recipe to each other in the Accompaniments field, and do not list the sauce ingredients in the swordfish recipe. NOTE: If the author lists a store-bought ingredient as a substitute or second choice for the integral part recipe, include an appropriate EYB substitution Comment, being sure to reference the sub-recipe's name exactly as it appears in the book: Can substitute store-bought garam masala for the book's "Easy garam masala" specified in this recipe. To learn more about categorizing recipes within recipes, see Recipe Types. e.g. See recipe for a vegetarian variation. e.g. Can substitute whole wheat flour for rye flour, and raisins for currants. e.g. EYB has corrected a typo in the recipe title, which appears in the book as "Chicken with brocolli." e.g. This recipe appears in a "Tips" sidebar. e.g. Despite the title, this recipe does not call for garlic. Sentence fragments are acceptable, but enter each EYB Comment with an initial capital letter and a period (.) at the end. Enter multiple Comment sentences as one block paragraph. Can substitute A for B. - make sure the ingredient you've listed in the Ingredients field is B/the last one listed, and the suggested substitution is A/the first one listed. Can substitute A for B, and C for D. - if there are two different substitution pairs, separate them with a comma. Can substitute A for B, C for D, and E for F. - if there are more than two different substitution pairs, separate them with a comma, and use a comma before the final "and" (i.e., use a "serial comma"). Can substitute A for B; C, D, or E for F; and G for H. - if there are any internal commas within a substitution "group," use semicolons to separate them, and use a semicolon before the final "and" (i.e., use a "serial semicolon"). The major ingredients in the recipe are selected here from a drop-down list. See below for EYB's definition of what are considered Major ingredients that must be listed, and what are considered common pantry/Store-cupboard ingredients that are not listed when they are present in small quantities/amounts. This field accepts as many Ingredients as you need to enter. Refer to Additional Information below for instructions on how to enter data. NOTE: Ingredients do not need to be entered in the order in which they appear in the recipe, in order of importance, or any particular order. In fact, missed ingredients and other ingredients added after the recipe is first indexed will show up at the bottom of the list of ingredients. NOTE: If you're not sure whether to include the ingredients for a sub-recipe, make sure you read the sections Accompaniments and Recipes within recipes. Begin entering a word/characters from the ingredient name. Once you enter at least 3 characters, the system will display a drop-down of the first 30 ingredients containing the word/characters you entered, with exact matches listed first, then ingredients starting with the word/characters, then ingredients containing the word/characters anywhere else. To select an ingredient from the drop-down, use the down arrow key until the one you want is highlighted, or continue to type until the ingredient comes to the top of the list; press Enter to select that ingredient and generate the next box. Alternatively, you may highlight the desired ingredient on the drop-down using your mouse/trackpad, then press Enter to select. If the drop-down goes away before you’ve made your selection, press the down arrow key to call it up again. NOTE: An ingredient is not added until it moves out of the box and displays in the Ingredients list above the box with a delete sign (x) next to it. If there are more than 30 ingredients containing what you entered and you do not see the ingredient you want in the drop-down, type a few more characters or the next word in the ingredient name, or try typing a less-common word in the ingredient name to narrow the display of matching ingredients. If the word/character string you entered exactly matches the first option at the top of the list in the Ingredients drop-down, press Enter to select that ingredient and generate the next Ingredients box. Deleting an ingredient: If you add an incorrect ingredient, delete it by clicking the (x) next to the ingredient. EYB defines the major ingredients as the ingredients that a user is likely to list when searching for a recipe. Herbs and spices (but not table salt and pepper) are major ingredients because users are likely to search for these. Indexed as a group name "store-cupboard ingredients" - if there are several store-cupboard ingredients in small quantities in the same recipe that have been omitted but collectively represent more than half the total number of ingredients in the recipe, or more than half the recipe's volume. Select 'store-cupboard ingredients' from the ingredients list, or use the shortcut 'sc'. Refer to the Store-Cupboard Ingredients Table for the list of ingredients EYB considers omittable as store-cupboard ingredients, and the rule-of-thumb/threshold amount for each. If an ingredient is a major part of the dish, always include it. For example, eggs would always be included in a recipe for an omelet or any other recipe categorized as Egg dishes. If any ingredients are mentioned in the Recipe name, no matter what the quantity, those ingredients must be included. For example, for a recipe entitled “Spinach with lemon and garlic,” both lemons and garlic must be listed as ingredients even if they are below the rule-of-thumb. If most of the recipe consists of store-cupboard ingredients in quantities below the rule-of-thumb, for example, a cake, cookies, or bread, then list the special EYB ingredient "store-cupboard ingredients" along with any other major ingredients. DON'T list store-cupboard ingredients just because you've omitted one or more ingredients. A general guideline is to list the special "ingredient" store-cupboard ingredients only if the omitted ingredients represent more than half the total number of ingredients or more than half the recipe's volume when combined, not counting salt, pepper, and water/ice toward the total. If the entire recipe consists of store-cupboard ingredients below the thresholds, do not list store-cupboard ingredients as the only "ingredient"; instead, list the top 1 or 2 ingredients in the recipe. Ingredients in the Store-Cupboard Ingredients Table refer to the specified “base” ingredient, not their sub-varieties, which should always be included as specified in the recipe. For example, don’t list red wine - unless in the title, but do list Marsala wine, Chianti wine, dry red wine, etc. ; don’t list milk, but do list goat milk, soy milk, buttermilk, etc. (5) store-cupboard ingredients to cover the 5 ingredients you omitted – white sugar, dark brown sugar, light brown sugar, baking soda, and vanilla extract – because they do not meet the Store-Cupboard Ingredients Table thresholds for listing, but they do represent more than half the total number of ingredients. rather than indexing store-cupboard ingredients for the flour, which is technically omittable as it is under the the Store-Cupboard Ingredients Table threshold for listing, but the flour represents more than half the volume of ingredients. If the recipe calls for “dried porcini mushrooms,” select dried porcini mushrooms, as opposed to mushrooms or porcini mushrooms. If a recipe calls for “canned beans“ without specifying a variety, select canned beans; however, for “canned fava beans,” select fava beans as there is no specific “canned” version of this ingredient on the list, and the variety of beans is more significant in this instance. Sometimes you need to enter an ingredient in different ways to find the ingredient as many ingredients have several name variations. EYB does not always create a separate ingredient for every form in which an ingredient can be called for in a recipe, but indexers may suggest new ingredients where appropriate as described below in Ingredients not listed. NOTE: Instead of creating new ingredients for every low-fat, low-calorie, etc. version of most dairy (and other) products, EYB usually advises listing the "normal" ingredient and indexing an appropriate Nutrition tag if the focus of the recipe is Low fat, Low calorie, Low carb, Low salt, or Low sugar. Most varieties of potatoes are listed as potatoes unless baking potatoes, red potatoes, etc. Most types of apples are listed as apples unless tart apples, red-skinned apples, green-skinned apples, etc. Most tomato varieties, including plum and Roma, will just be indexed as tomatoes unless cherry tomatoes, yellow tomatoes, canned tomatoes, etc. Bittersweet and semisweet chocolate are indexed as dark chocolate. Fresh (-squeezed) citrus fruit juices are indexed as the respective fruit – lemons, limes, oranges, grapefruits, etc. ; the same is true for citrus zest/peel. Both flat-leaf/Italian parsley and curly parsley are indexed as 'parsley'. For most herb ingredient names, the “default” format is the fresh herb – basil, cilantro, parsley, dill, etc. The dried version of each herb is usually available as a separate indexable ingredient. Index whichever version is called for, but if fresh vs. dried is not specified in the recipe, choose the default/unspecified version. NOTE: One exception is dried oregano (the more common dried herb), with fresh oregano available as a separately indexable ingredient. For most spice ingredient names, the “default” format is the ground/powdered version of the spice – cinnamon, cloves, cardamom, allspice, nutmeg, turmeric, etc. The whole version of the spice is usually available as a separate indexable ingredient. Index whichever version is called for, but if ground vs. whole is not specified in the recipe, choose the default/unspecified version. NOTE: An exception is fresh ginger, which in EYB refers to the fresh root, with ground ginger available as a separately indexable ingredient. If only whites are called for, list egg whites no matter how many. If only yolks are called for, list egg yolks no matter how many. If hard-boiled/hard-cooked eggs are called for, index hard-boiled eggs (or the variation hard-cooked eggs) no matter how many. If egg whites and egg yolks are called for, combine them into “whole-egg equivalents" and list eggs if the number of whole-egg equivalents is even (no partial eggs left over), e.g., recipe calls for 3 whites plus 3 yolks, so list eggs as this is 3 whole-egg equivalents. If whole eggs/whole-egg equivalents plus any number of additional egg whites/egg yolks are called for, list eggs and either egg whites or egg yolks, as appropriate, e.g., recipe calls for 2 whole eggs plus 6 egg whites and 3 egg yolks, so list eggs and egg whites as this is 5 whole-egg equivalents with 3 additional egg whites. Some ingredient names differ significantly depending on the country/cuisine. In these cases, EYB has created a master ingredient with one or more linked variations. Regional variation: e.g. “eggplants” in the US, Canada, Australia and New Zealand are called “aubergines” in the UK. Spelling variation: e.g. the herb mix za’atar can also appear in recipes as zaatar, zahtar, and zathar, among other spellings. Indexers should list the ingredient that appears in the recipe, so that users will see “aubergines” listed in recipes from UK cookbooks, but users searching for either ‘aubergine'or ‘eggplant’ will find this recipe. When entering an ingredient that matches a name variation of an ingredient, you will see the variation appearing in square brackets after the “master” ingredient it is associated with. Selecting this ingredient will cause the square-bracketed variation to display in the recipe on the EYB database. Selecting an ingredient that matches a spelling variation of an ingredient will cause the master ingredient to display in the recipe on the EYB database, but all the existing spelling variations will be searchable. Index the first one listed. For example, if the recipe states “2 lbs. ground beef or ground turkey,” index ground beef. Include an EYB Comment if the option is significantly different, as in this case, such as Can substitute ground turkey for ground beef. Do not include an EYB Comment for common or self-explanatory substitutions, such as canned beans for dried, or a dried herb for fresh. If a lot of suggested ingredients are provided, such as “1 c. nuts (can use walnuts, pecans, almonds, or hazelnuts, or a combination of any of these),” index nuts of your choice, and add an EYB Comment, such as, "See recipe for nut suggestions." If any ingredients are listed in the recipe as optional, leave them out. If you cannot find exactly the ingredient you want, then index what seems closest and add an explanatory note in the Indexer Notes field so that EYB can review the ingredient you have selected. Or if nothing seems to fit, request a new ingredient by typing the name of the suggested new ingredient in the New Ingredients field, along with any available back-up/explanatory information in the Indexer Notes field. For EYB Pro Indexers ONLY: See the More about... note at the end of New Ingredients below for specific instructions when requesting new ingredients. Enter just the new ingredient/variation name(s) in this field. Separate multiple new ingredients with semicolons (;). If the author provides any information about the new ingredient, such as synonyms, alternate spellings, sources, etc., enter this information into the Indexer Notes field. If you are requesting a new variation of an existing ingredient, e.g. when an ingredient is known by a different name in the UK or Australia than it is in the US, provide the name of the existing ingredient in Indexer Notes. If the book you are working on calls for a number of new ingredients, and particularly if the same ingredient is required for multiple recipes, send an email to the Data Manager (deborah@eatyourbooks.com) while you are in the process of indexing the book to request that the new ingredient(s) be added to the Ingredients table so that you can index the new ingredients before you finish the cookbook. In addition to entering the requested new ingredient or variation into the New Ingredients field, EYB Pro indexers should also list the special ingredient 'new ingredient' (shortcut code = 'ni') in the Ingredients field. Indexing 'new ingredient' ensures that you will be paid for every ingredient you've indexed, including the new ones you've requested. NOTE: You can only enter 'new ingredient' once per recipe, so if you need multiple new ingredients for the same recipe, it's advisable to email the Data Manager as described in 4. above and request that the new ingredients be created so you can use them while you're indexing the assignment. This field does not display on EYB and can be used to make notes to yourself or to communicate with the Data Manager. remind yourself that you need to return to a recipe to cross-reference another recipe located later in the book as described under Accompaniments. When you are done adding Accompaniments, be sure to delete any Indexer Notes to yourself. enter questions or comments about a recipe for the Data Manager. provide supporting information about new ingredients requested. When you reach the end of the book, use the Recipes Added Table to sort by this column. See Recipes Added Table for more information about finding and editing recipes. NOTE: EYB discourages Members indexing their books from searching for and adding Online URL's at this time. Many online recipe sources are not legitimate because they reproduce recipes without the copyright holder's permission, so EYB has restrictions on the sources we link to as well as the number of URL's certain publishers allow. This field is used to provide the web address where the recipe can be found online, either a link to a blog recipe, or a link to an "official" website that is authorized to reproduce a book or magazine recipe. For recipes appearing in magazine issues, the order of preference for websites is publisher, then author. Selected magazine recipes appear on official partner websites, e.g., epicurious.com publishes recipes from Bon Appetit and Gourmet, so if a recipe doesn't appear on the magazine publisher's website, it is acceptable to provide a link to the recipe on a partner website. For recipes appearing in books, the order of preference for websites is: author, publisher/TV network (for TV show tie-in books, such as those from Food Network chef-authors), newspapers, and magazines. The Photo field is directly tied in to the Online URL field -- in other words, the Online URL has to be present in order for the system to try to locate any photos of the recipe on the magazine website. As you copy-and-paste each recipe's URL, the Photo field should pull up all available photos. If there's only one photo that loads in the thumbnail photo box, check that it's really a photo of the finished recipe before Saving the recipe . If there are multiple photos available, the system will display the first one in the thumbnail box with "1 of X" below it along with a set of navigation arrows (<</>>). Use the arrows to move through the photos in order to select the best one that depicts the finished recipe, then make sure that photo is displayed when you Save the recipe; the others will be ignored by the system. If there is no appropriate photo, click on the "No Photo" box below the photo area before Saving. (NOTE: The No Photo checkbox causes the photo to not be loaded to EYB when the blog/magazine issue is approved, but the checkbox does not stay checked, nor does the photo go away). If you can see a suitable recipe photo in the blog post or on the online magazine site but it isn't loading into the EYB recipe, please add a note in Indexer Notes -- Photo won't load -- and EYB staff will try to add it manually. (1) If you selected "No Photo" on the first pass when you looked over the possible photos, and then call up the recipe again in proofreading, you should see a photo in the display box but NO "Edit" button. If you are making any changes to that recipe and Saving it, you will need to check off the "No Photo" box again before Saving to make sure the system doesn't load that incorrect photo. If you're not making any changes and will just be clicking the >> button to move on to the next recipe, you don't need to re-tick the "No Photo" box before leaving the recipe. (2) If on the other hand, you selected a photo during the first pass (by having it displayed when you Saved the recipe), you will see that photo displayed along with the "Edit" button next to it, which allows you to review the possible photos again in case you want to make a different selection before Saving. For magazine recipes only, the Photo Credit field allows you to enter the name of the photographer to whom the photo of the finished recipe in the Photo field is attributed; sometimes this information is only available in the print magazine issue and not online. This field only accepts one name. This field indicates the page number on which a recipe appears in a book or in a magazine issue. Page Number does not appear on the data entry form for blog recipes. If the recipe continues on additional page(s), enter just the page number on which the recipe starts, i.e., the page on which the recipe title first appears, even if the bulk of the recipe appears on additional page(s). Disregard any extra pages on which a photo of the recipe, an introduction, a headnote, etc., appears if not on the same page as the recipe itself. The Author field only appears on the data entry form for magazine and blog recipes. This field indicates the chef, cookbook author/recipe creator, or other "celebrity" name, if any, attributed to the recipe being indexed, and is selected from a drop-down menu. If an author's name does not appear in the EYB Author list, it cannot be selected for this field. You can index more than one Author where appropriate. If the blog is a single-author blog, e.g., Dorie Greenspan is the author of the blog In the Kitchen and On the Road with Dorie, the system will automatically supply the blogger's name by default in all blank Author fields when the blog recipes are approved for the EYB database. DO NOT enter the blogger's name in the Author field if the recipe is only attributed to the blogger. If the blogger attributes a recipe to another author/chef, enter that other person's name in the Author field as described above. This table lists the recipes in the order they appear in the book -- the Sort Order -- and adds each new recipe to the Recipes Added table as you save it. Use the table to review and edit your recipes. 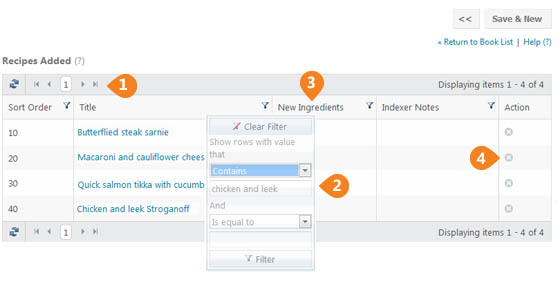 Finding recipes/filtering: To find a particular recipe by its title, use the Filter feature: just click on the funnel to the right of the Recipe Title and enter your search criteria into the box(es). In the example below, the recipe ‘Chicken and leek Stroganoff’ can be found by selecting ‘contains’ in the first Filter drop-down and entering ‘chicken and leek’. Sorting: The default order for the list is by Sort Order. You can change the order by clicking on the label of the Title, New Ingredients, or Indexer Notes column. One click lists in ascending order, a second in descending order. This is useful, for example, to group all the recipes with Indexer Notes or New Ingredients together when editing your recipes. Note: To select a recipe from a filtered or sorted list without losing your filter/sort result, press CTRL-click when you click on the recipe name on a PC, or Command-click on a Mac, which will open that recipe in a new tab. After reviewing the recipe and saving any changes, you can close that tab and return to your original tab to continue accessing your original filtered/sorted list. Otherwise, if you click directly on the recipe name in a filtered or sorted list, the system will default back to the entire Recipes Added list after you finish with the recipe you accessed.